Australia is a country in the Southern hemisphere between the Pacific Ocean and the Indian Ocean. 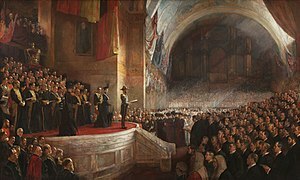 Its official name is the Commonwealth of Australia. Australia is the sixth biggest country in the world by landmass, and is part of the Oceanic and Australasian regions. The Australian emblem is a flower called the Golden Wattle. 23–24 million people live in Australia, and about 80% of them live on the east coast. About 60% live in and around the mainland state capitals of Sydney, Melbourne, Brisbane, Perth and Adelaide. Australia's capital city is Canberra. Australia is known for its mining and for its production of wool. Australia is the world's largest producer of bauxite. Australia, New Zealand, New Guinea and other islands on the Australian tectonic plate are together called Australasia. They form one of the world's great ecozones. When other Pacific islands are included, the term is Oceania. Australia's landmass of 7,617,930 square kilometers is on the Indo-Australian plate. The continent of Australia, including the island of Tasmania, was separated from the other continents of the world many millions of years ago. Because of this, many animals and plants live in Australia that do not live anywhere else. These include animals like the kangaroo, the koala, the emu, the kookaburra, and the platypus. In July 2007 Australia had just over 21 million people. Most Australians live in cities along the coast, such as Sydney, Melbourne, Brisbane, Perth, Darwin, Hobart and Adelaide. The largest inland city is Canberra, which is also the nation's capital. The largest city is Sydney. The Australian Aboriginal people arrived in Australia more than 50,000 years ago. Until the arrival of British settlers in 1788, the Aboriginal people lived by hunting and gathering food from the land. They lived in all sorts of climates and managed the land in different ways. An example of Aboriginal land management was the Cumberland Plain where Sydney is now. Every few years the Aboriginal people would burn the grass and small trees. This meant that a lot of grass grew back, but not many big trees. Kangaroos like to live on grassy plains, but not in forests. The kangaroos that lived on the plain were a good food supply for the Aboriginal people. Sometimes, Aborigines would name a person after an animal, and they could not eat that animal to help level out the food population. Aboriginal people did not usually build houses, except huts of grass, leaves and bark. They did not usually build walls or fences, and there were no horses, cows or sheep in Australia that needed to be kept in pens. The only Aboriginal buildings that are known are fish-traps made from stones piled up in the river, and the remains of a few stone huts in Victoria and Tasmania. The Aboriginal people did not use metal or make pottery or use bows and arrows or weave cloth. In some parts of Australia the people used sharp flaked-stone spearheads, but most Aboriginal spears were made of sharply pointed wood. Australia has a lot of trees that have very hard wood that was good for spear making. The boomerang was used in some areas for sport and for hunting. The British Government were sure that there must be a very large land in the south, that had not been explored. They sent Captain James Cook to the Pacific Ocean. His ship, HMS Endeavour, carried the famous scientists, Sir Joseph Banks and Dr Solander who were going to Tahiti where they would watch the planet Venus pass in front of the Sun. Captain Cook's secret mission was to find "Terra Australis" (the Land of the South). In the 1700s, in England, laws were tough, many people were poor and gaols (jails) were full. A person could be sentenced to death for stealing a loaf of bread. Many people were hanged for small crimes. But usually they were just thrown in gaol. Often they were sent away to the British Colonies in America. But in the 1770s, the colonies in America became the United States. They were free from British rule and would not take England's convicts any more. Captain Phillip found that Botany Bay was flat and windy. There was not much fresh water. He went with two ships up the coast and sailed into a great harbour which he said was "the finest harbour in the world!" There were many small bays on the harbour so he decided on one which had a good stream of fresh water and some flat shore to land on. On the 26th January, 1788, the flag was raised and New South Wales was claimed in the name of King George III of England, and the new settlement was called Sydney. For the first few years of the settlement, things were very difficult. No-one in the British Government had thought very hard about what sort of convicts should be sent to make a new colony. Nobody had chosen them carefully. There was only one man who was a farmer. There was no-one among the convicts who was a builder, a brickmaker or a blacksmith. No-one knew how to fix the tools when they broke. The cattle all escaped. There were no cooking pots. All the plants were different so no-one knew which ones could be eaten. There was a grave danger that everyone in the new colony would die of starvation. Because Australia is such a very large land, it was easy to think that it might be able to hold a very large number of people. In the early days of the colony, a great number of explorers went out, searching for good land to settle on. When the settlers looked west from Sydney, they saw a range of mountains which they called the Blue Mountains. They were not very high and did not look very rugged but for many years no-one could find their way through them. In 1813 Gregory Blaxland, William Lawson and a 17 year-old called William Charles Wentworth crossed the Blue Mountains and found land on the other side which was good for farming. A road was built and the Governor, Lachlan Macquarie founded the town of Bathurst on the other side, 100 miles from Sydney. The goldrushes of New South Wales and Victoria started in 1851 leading to large numbers of people arriving to search for gold. The population grew across south east Australia and made great wealth and industry. By 1853 the goldrushes had made some poor people, very rich. Australians had started parliamentary democracries all across the continent. But voices were getting louder for all of them to come together as one country with a national parliament. In 1914, the First World War started in Europe. Australia joined in on the side of Britain against Germany, Austria-Hungary and Turkey. Australian soldiers were sent to Gallipoli, in Turkey. They fought bravely, but were beaten by the Turks. Today Australia remembers this battle every year on ANZAC Day. They also fought on the Western Front. More than 60,000 Australians were killed. When the war ended, Australia felt that it needed many more people to fill the country up and to work. So the government said it would take in people from Europe who had lost their homes in the war. It did things like build the Snowy Mountains Scheme. Over the next 25 years, millions of people came to Australia. They came especially from Italy and Greece, other countries in Europe. Later they also came from countries like Turkey and Lebanon. An important new party, the Liberal Party of Australia was made by Robert Menzies in 1944 and it won lots of elections from 1949 until in 1972, then Gough Whitlam won for the Labor Party. Whitlam made changes, but he made the Senate unhappy and the Governor-General sacked him and forced an election in 1975. Then Malcolm Fraser won a few elections for the Liberal Party. In the 1960s many people began coming to Australia from China, Vietnam, Malaysia and other countries in Asia. Australia became more multicultural. In the 1950s and 1960s Australia became one of the richest countries in the world, helped by mining and wool. Australia started trading more with America, then Japan. Australia supported the United States in wars against dictatorships in Korea and Vietnam and later Iraq. Australian soldiers also helped the United Nations in countries like East Timor in 1999. Australia is made up of six states and three mainland territories. Each state and territory has its own Parliament and makes its own local laws. The Parliament of Australia sits in Canberra and makes laws for the whole country, also known as the Commonwealth or Federation. The Federal government is led by the Prime Minister of Australia, who is the member of Parliament chosen as leader. The current Prime Minister is Tony Abbott. The leader of Australia is the Prime Minister, although the Governor-General represents the Queen of Australia, who is also the Queen of Great Britain, as head of state. The Governor-General, currently, Her Excellency Ms Quentin Bryce, is chosen by the Prime Minister. Australia was colonised by people from Britain, but today people from all over the world live there. English is the main spoken language, and Christianity is the main religion though all religions are accepted and not everybody has a religion. Australia is multicultural, which means that all its people are helped to keep their different languages, religions and ways of life, while also learning English and joining in with other Australians. Sport is an important part of Australian culture because the climate is good for outdoor activities. 23.5% Australians over the age of 15 regularly take part in organised sporting activities. In international sports, Australia has very strong teams in cricket, hockey, netball, rugby league and rugby union, and performs well in cycling, rowing and swimming. Local popular sports include Australian Rules Football, horse racing, soccer and motor racing. Australia has participated in every summer Olympic Games since 1896, and every Commonwealth Games. Australia has hosted the 1956 and 2000 Summer Olympics, and has ranked in the top five medal-winners since 2000. Australia has also hosted the 1938, 1962, 1982 and 2006 Commonwealth Games. Other major international events held regularly in Australia include the Australian Open, one of the four Grand Slam tennis tournaments, annual international cricket matches and the Formula One Australian Grand Prix. Corporate and government sponsorship of many sports and elite athletes is common in Australia. Televised sport is popular; some of the highest-rated television programs include the Summer Olympic Games and the grand finals of local and international football competitions. ↑ 1.0 1.1 English does not have de jure status. ↑ "Pluralist Nations: Pluralist Language Policies?". 1995 Global Cultural Diversity Conference Proceedings, Sydney. Department of Immigration and Citizenship. Archived from the original on 20 December 2008. http://www.immi.gov.au/media/publications/multicultural/confer/04/speech18b.htm. Retrieved 11 January 2009. "English has no de jure status but it is so entrenched as the common language that it is de facto the official language as well as the national language." ↑ Collins English Dictionary. Bishopbriggs, Glasgow: HarperCollins. 2009. p. 18. ISBN 978-0-00-786171-2 . ↑ "Population clock". Australian Bureau of Statistics website. Commonwealth of Australia. http://www.abs.gov.au/ausstats/abs@.nsf/94713ad445ff1425ca25682000192af2/1647509ef7e25faaca2568a900154b63?OpenDocument. Retrieved 24 April 2013. The population estimate shown is automatically calculated daily at 00:00 UTC and is based on data obtained from the population clock on the date shown in the citation. ↑ Australian Bureau of Statistics (31 October 2012). "Australia". 2011 Census QuickStats. http://www.censusdata.abs.gov.au/census_services/getproduct/census/2011/quickstat/0?opendocument&navpos=220. Retrieved 21 June 2012. ↑ 6.0 6.1 6.2 6.3 "Australia". International Monetary Fund. http://www.imf.org/external/pubs/ft/weo/2012/02/weodata/weorept.aspx?pr.x=85&pr.y=13&sy=2012&ey=2012&scsm=1&ssd=1&sort=country&ds=.&br=1&c=193&s=NGDPD%2CNGDPPC%2CPPPGDP%2CPPPPC&grp=0&a=. Retrieved 8 April 2013. ↑ "Alcola World Alumina Australia". MAMS.RMIT.edu.au. http://mams.rmit.edu.au/0wzm6liriybr1.PDF. Retrieved December 11, 2014. ↑ Turner, Kate (2008). National Geographic Australia. Tokyo: Horupu. p. pp.8. ↑ Cummins, Brian R. (1990). Australia. Canberra: the Australian Government Publishing Service. pp. 16-17. ↑ "AEC.gov.au". AEC.gov.au. 25 Oct. 2007. http://www.aec.gov.au/Voting/indigenous_vote/indigenous.htm. Retrieved 27 Jun. 2010. ↑ Takao Fujikawa (2004). A New History of Australia. Tokyo: ARMA. p. pp. 40. ↑ Smith, Michelle (4 April 2014). ""Our fascination with "Bogans" will be televised"". The Conversation. http://theconversation.com/our-fascination-with-bogans-will-be-televised-25262. Retrieved 19 November 2014. ↑ "About Australia". NDCA. http://www.ndca.asn.au/other-information/about-australia/. Retrieved 2013-06-18. ↑ Australian government. "Art festivals". http://www.dfat.gov.au/facts/arts_festivals.html. Retrieved 15 November 2010. This page was last changed on 20 August 2015, at 23:09.